Silage makes an excellent feed for ruminant animals. However, feeding silage is much different than feeding hay. Silage, because it is much wetter than hay, is much more susceptible to deterioration. Sealed from oxygen during storage, the forage undergoes fermentation. However, when it is once again exposed to air when it is fed, it can still deteriorate quickly. Because of this, baled silage must be managed slightly different than hay. Whether it is in an upright, bunker, pit, or bag silo or as a wrapped bale, the process of fermentation is very similar. Essentially, bacteria that occur naturally on the surface of dying plant leaves undergo massive population buildups once oxygen is excluded from their environment. They derive energy from the sugars that are inherent in plant cell sap and tissue via a fermentative process. They undergo many, many cycles of feeding and reproduction until their populations become so high that the waste of their fermentation processes leads to a buildup of acid. This is why silage has a low pH. The smell of silage is also the by-products of the fermentation process. Though this silage is produced in bulk in a silo or wrapped bale, the fermentation is essentially the same process that happens on a smaller scale when a ruminant animal such as a cow, sheep, or goat ingests the forage. This is why this feed is such a natural fit for dairy, beef, sheep, and goat production. Essentially silage is “pre-ruminated” forage. But, therein lies the major issue with feeding silage: instability. An analogy to our eating habits would be potato salad. Pre-cooked and prepared, it doesn’t need to set out very long before we eat it. This is especially true at a summer picnic where temperatures can speed the deterioration. But, this can also occur in the winter time, even though it may take longer for it to spoil. In either case, it is not worth the chance of eating it if it has set out very long. Thus as a “rule of thumb,” never leave silage exposed to the air more than two days during feeding. If the daytime temperature exceeds 60○F, don’t leave it exposed more than one day. This rule of thumb is especially important for producers who feed baled silage (haylage). It is extremely critical to those who use an in-line bale wrapper, since this determines the feed-out rate. If you have made baled silage using an in-line bale wrapper, you must be feeding enough animals that you can feed at least one bale per day in the winter. This is because as a bale is fed, the next bale is being exposed to air. Individually wrapped bales are usually not subject to exposure before they are fed, and thus the feeding schedule is somewhat more flexible. • Ensure that the storage site doesn’t increase the chances of exposure to air. Some storage sites increase the likelihood of punctures to the plastic wrap. Examples would be areas near trees that have dropped limbs, rodent and other varmint dens, or that are freshly mowed and have coarse weed stubble. Many of these may create punctures that go unnoticed until it is too late. • Ensure that the forage is between 45-65% moisture before it is wrapped and ensiled. Baling when the crop is too dry is the most common problem because a field may start out at the right moisture and end up being too dry. Dry forage doesn’t provide the bacteria enough moisture to allow sufficient fermentation. But, it does allow fungi to grow during storage and feeding that can lead to deterioration. Baling too wet is less common. However, high moisture silage spoils more quickly when exposed to air. • Don’t spear into bales after they have been wrapped. Squeeze carriers or handlers are better, but may still stretch, tear, or puncture bales. Any hole in the plastic barrier can lead to small areas or even entire bales that deteriorate. • To feed a bale that has been wrapped using an in-line wrapper, simply spear into the bale, lift, and pull away. The plastic between it and the next bale will tear away. Then cut over the top and peel the plastic off in one large section. To feed an individually wrapped bale, cut a large X in the end to be speared and pull back the flaps. Spear the bale, lift, and cut across the top and down the other flat side to peel the plastic off in one piece. In both cases, twine should then be removed before placing in the paddock and placing a feeding ring around the bale. • The ensiling process usually completes within 2-6 weeks, depending on a large number factors. Yet, at essentially any point, the forage can be fed. The feeding rate should still be relatively quick, however, as excessive heating, as well as spoilage, could be significant if exposed for days or even hours. 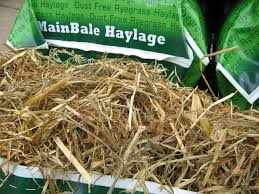 Wastage and refusal is rarely an issue with feeding baled silage, unless a bale is being fed to too few animals. If silage remains when the time frame for feeding has been exceeded, put out a fresh bale. Forcing animals to eat waste or refused silage may force them to eat deteriorated material and can lead to animal health issues. 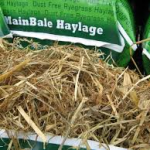 Bale size, which can usually be adjusted on the baler, should be determined during the growing season by considering the number of animals and the feed out rate that will be needed during the feeding period. • How Do I Select Quality Hay? • How Can a Farmer Preserve High-Quality Silage?